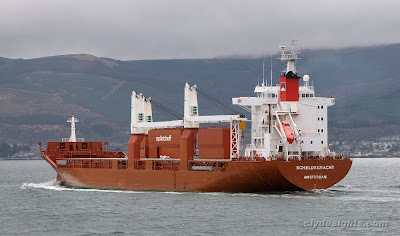 Formerly seen on the Clyde on a regular monthly basis, today witnessed the first visit for almost a year by one of the 'S' class freighters belonging to the Dutch Spliethoff company. SCHELDEGRACHT, one of the company's ships that last visited the Clyde in October 2007, arrived at Brodick Bay yesterday from Rauma, moved upriver to Greenock early this morning and loaded a cargo of paper, and was seen as she sailed this afternoon for Jacksonville in the USA. She was built by Stocznia Szczecińska Nowa, and joined the fleet in December 2000. 172.6 metres in length, she has a deadweight of 21,449 tonnes. Her three deck cranes are rated at a maximum of 120 tonnes each, and five side loaders are fitted within the two large housings on her starboard side. Why such an unusual design? What are the two big red "blocks" on the deck? the two red blocks are the housings for the elevators that are used for loading the paper reels. See also on www.spliethoff.com go to cargo and select forest products.